Easy to set up and operate the MiniNail is ready for 24/7 use. Digital temperature display allows you to have complete control of your dabbing experience. This e-nail is extremely compact, just slightly larger than a business card & weighs only 5 oz. Fits int the palm of your hand with fully adjustable temperatures maxing out at 1000 degrees with low power usage. Your rig is pre-calibrated for accurate temperatures. Fully customize your MiniNail™ Box Kit. Choose your favorite box color, preferred accessory color & design. With 3rd party lab tested titanium and interior fuse for increased safety, our in-house engineers have built the MiniNail tough. Satisfaction is guaranteed with a 2 year warranty. 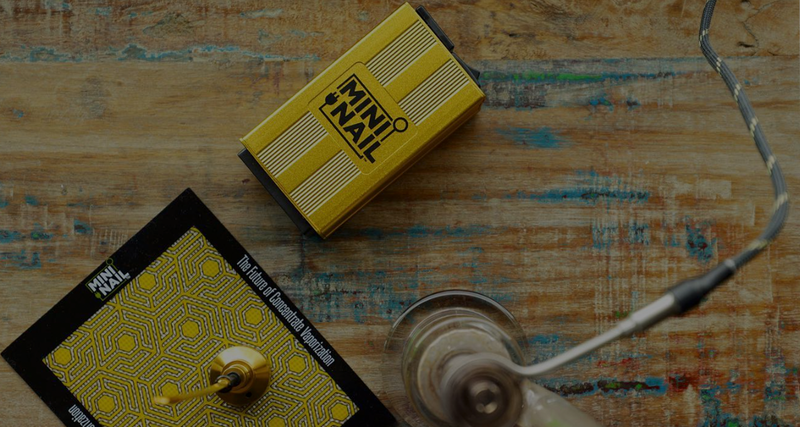 "The MiniNail at its simplest, is an electric concentrate vaporizer. That however, sells this budding star a bit short. With this awesome contraption by your side, there’s no longer need to bust out a torch on your nail with a best estimate on the heat." “I use the MiniNail because it’s small, offers precise temperature control, and doesn’t require the use of a torch. It’s always hot and ready when I want to dab or pass one to a friend." MiniNail Two (2) Year Limited Warranty. MiniNail provides two years of coverage for only the electronic base. This covers defects in materials and workmanship for two years from the date of original retail purchase. MiniNail does not warranty glass, atomizers, normal wear and tear, or damages caused by accident or abuse.